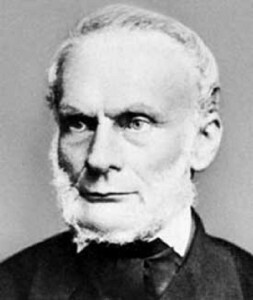 Born on January 2, 1822, in Köslin, Prussia, Rudolf Clausius was the son of a pastor who also served as principal of the local school. At the University of Berlin, Clausius was at first attracted to history, but gradually became more interested in science. Because of financial difficulties, he had to work as a teacher in Berlin while he finished his own education, receiving his doctorate in 1848. In 1850 he took a professorship at the Royal Artillery School and in that same year presented his first paper on thermodynamics, the study of how energy moves and transforms from one form to another. He taught at several other universities, finally settling at the University of Bonn, Germany; in 1869, where he remained for the rest of his life. Many scientists had studied heat during the first half of the nineteenth century and had reached some important conclusions. For example, SADI, CARNOT described the way heat flows in a steam engine, and JAMES JOULE showed that heat is equivalent to mechanical energy. Clausius clarified their terminology, improved their mathematics, and unified their ideas into the two great laws of thermodynamics. Clausius tackled a problem in Carnot’s work on heat engines: Carnot had considered only idealized, perfectly reversible processes. In fact, all of classical physics assumed that laws of nature work equally well running forward or backward, like watching a movie in reverse. Clausius found a term in the mathematical equations used to describe heat engines that increases with time, making reversing the process impossible. He developed the concept concerning this new term by 1851, and in 1865 finally introduced it by name. He called it entropy; from the Greek word trope, meaning “transformation.” Entropy is a measure of disorder or randomness in a system. In Clausius’s new terms, the two laws of thermodynamics are: 1) the energy of the universe is constant 2) the entropy of the universe tends toward a maximum. The British scientist William Thomson (later named LORD KELVIN) developed the same laws at about the same time. Clausius stated them more simply and succinctly, and he was the one who conceived of the name, entropy, for the fundamental change that occurs in a system over time. Tragedy struck Clausius in 1875 when his wife died delivering their sixth child. He spent most of the rest of his life raising his family and died in Bonn on August 24, 1888. Rudolf Clausius’s two laws of thermodynamics created the groundwork for the field of thermodynamics. He analyzed the work of Joule and Carnot, synthesized their contributions, and created a universal theory that benefited future generations. Immediate applications of his laws resounded in all fields of science—from the study of gases under real conditions, to electrochemistry, to boiling, melting, and vaporizing, to capillary action, and especially to industrial chemistry. The laws took chemists, in particular, from trial and error methods to understanding theoretically what can and can not be accomplished. Clausius lived to see his own work taken to yet another level. In 1875 the great American scientist J. Willard Gibbs used Clausius’s two laws of thermodynamics as the opening words in his paper on the theory of chemical equilibrium, which states that a point exists in the progress of a reversible chemical reaction where no net change occurs in the amounts of original or resulting chemicals. Chemical equilibrium proved to be a tremendously useful tool for chemists in both explaining chemical processes and predicting their outcomes. The laws that Clausius developed had extensive impact on fundamental questions regarding the universe. They began one of the longest ­lasting controversies in physics: how will the universe end? The first law claims that energy, whatever it is, is a special, conserved quantity in the universe; however much energy there was at the beginning of time, that energy is still around us today and always will be, in one form or another. The second law sets limits on the transformation of energy: heat must flow from hotter places to cooler ones, and if all the parts of a system are at the same temperature, no energy transformations can happen. These laws suggest the theory of the “heat death” of the universe: the universe will end in continual expansion, as the stars burn out one by one. It is proposed, however, that this won’t happen for dozens of billions of years. Our Sun alone has enough fuel to last for five billion years or more.